The Kickers soccer league is heating up, and Ben's team, the Bobcats, has two losses, one win, and one tie. Ben knows he can pull his team out of its slump and right into the league play-offs with his new move: the fake-out. He practices the tricky footwork every chance he gets. But every time he tries it on the field, he flubs up, loses the ball, and hurts his team. Meanwhile, everyone else is faking him out. Is Ben out of his league? 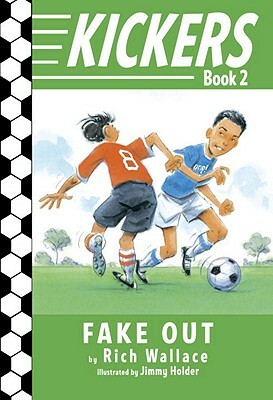 In his Kickers series, award-winning author Rich Wallace offers action-filled novels about the Bobcats, a fourth-grade coed soccer team, and their bid for the league play-offs. Rich Wallace is the acclaimed author of many books for young readers, including Wrestling Sturbridge, an ALA-YALSA Best of the Best Book for Young Adults; Shots on Goal, a Booklist Top 10 Sports Book for Youth; Perpetual Check; and the Winning Season series. He coached soccer for several years, beginning when his older son joined a team in kindergarten. Rich Wallace lives in New Hampshire with his wife, author Sandra Neil Wallace. You can visit him on the Web at www.richwallacebooks.com.